The Reading to Know Book Club read for the month of October is Uncle Tom's Cabin , by Harriet Beecher Stowe. Barbara at Stray Thoughts will be leading this month's book club discussion. I asked her if she would share why she selected this read for us and kick of this month's read and she kindly agreed. The following are her opening thoughts. 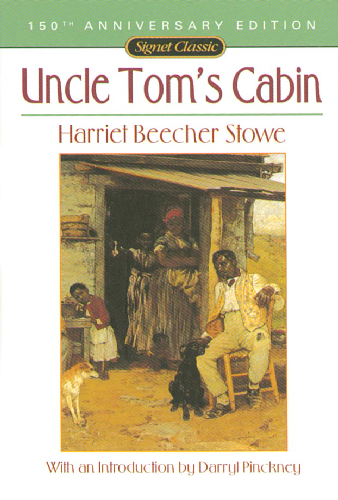 I've often asked myself why I chose Uncle Tom's Cabin , by Harriet Beecher Stowe when Carrie asked me to host a session of her Book Club, especially when there are so many great Christian biographies, Christian fiction, and Christian non-fiction that I would normally gravitate to and want to share. The short answer is that I was wanting to read this book again, and this looked like a good opportunity to incorporate it into my reading plans. The longer answer is what caused me to read the book the first time. I had not been interested in reading a book about slavery, which I considered a blight on our nation's history. But a former pastor mentioned this book and said Uncle Tom was "the kind of Christian you always wanted to be." That intrigued me. I hadn't known the book had a Christian perspective to it. An additional reason I wanted to reread it (besides having forgotten much of it) is that I had heard criticism of it in the intervening years since my last reading. Instead of seeing Tom as a noble example of Jesus's admonition to "Love your enemies, bless them that curse you, do good to them that hate you, and pray for them which despitefully use you, and persecute you," some saw him as an obsequious fawning sycophant. But I don't see how anyone can carefully read this book and think of Tom that way. He is not a weak character at all: it took great courage to handle his troubles as he did. I contrasted him with Kunta Kinte of Roots when I listened to that book, and one key difference is that Kunta maintained a hatred of the white man even after he "settled in" to his life as a slave and quit trying to run. While that is understandable from a human standpoint, this book is written from a Christian viewpoint. I've read similar testimonies to Tom's in true stories of people imprisoned for their faith in Communist countries and missionaries in Japanese prison camps during WWII. As you read, keep in mind that this book was written 160 years ago, so the language will be a little more wordy and descriptive than we're used to these days. The "show, don't tell" mantra for writers was not in vogue then. Plus, Mrs. Stowe can get a little preachy, and she sometimes appeals passionately directly to the reader. But I hope you'll look past that to the story itself. Her main purpose in the book was to showcase the evils of slavery and the humanity of slaves, and we have to remember people really did say and think some of the things these characters did. It was quite brave of her, especially as a woman in her day, to speak out as she did here. Beyond that, she purposed to point her characters and her readers to hope in God no matter what their circumstances. I hope you enjoy the book, and I look forward to hearing what you think about it. I was very glad when Barbara told me that she'd like to re-read Uncle Tom's Cabin . Like a lot of people, I first read it in high school. Late last year I began re-reading it but was sidetracked. So I'm very thankful for the opportunity to dive back in and complete the reading. Thanks, Barbara, for hosting! Looking forward to sharing this book with others during the month of October. Just a reminder, we wrap up our book club reads on the last Friday of the month. We have until Friday, October 26th to complete this read. Good choice, Barbara. I think it is vitally important that we understand our past as a nation that condoned slavery - and acknowledge the attitudes that still linger from those days. I look forward to the discussion about this book! I'm looking forward to it as well! Thanks for the opportunity. Oh goodness! I hope I can get through it. I am almost done with Gone With the Wind and Uncle Tom's Cabin is mentioned in that story so I am pretty excited about getting to it. I may have to start it before completing GWTW. Since I am reading this both for the book club and for Banned Books Week, I wrote a bit on the banning of books.